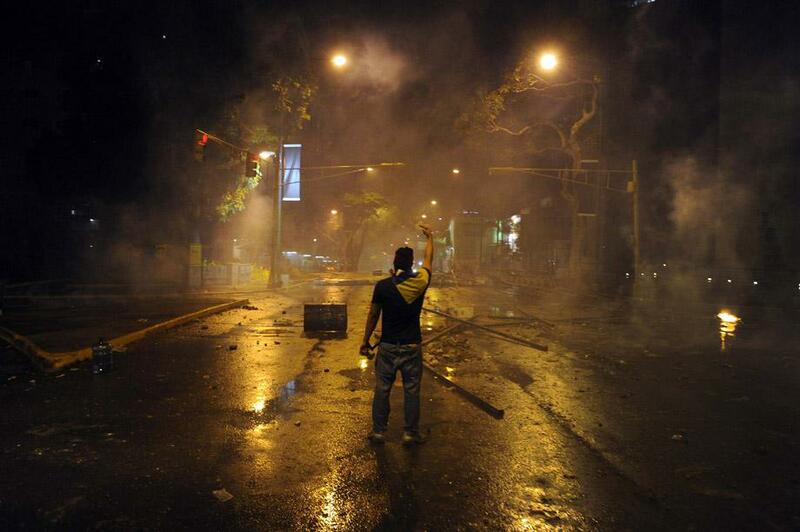 Venezuela protest photos: Police and protesters clash during demonstrations. 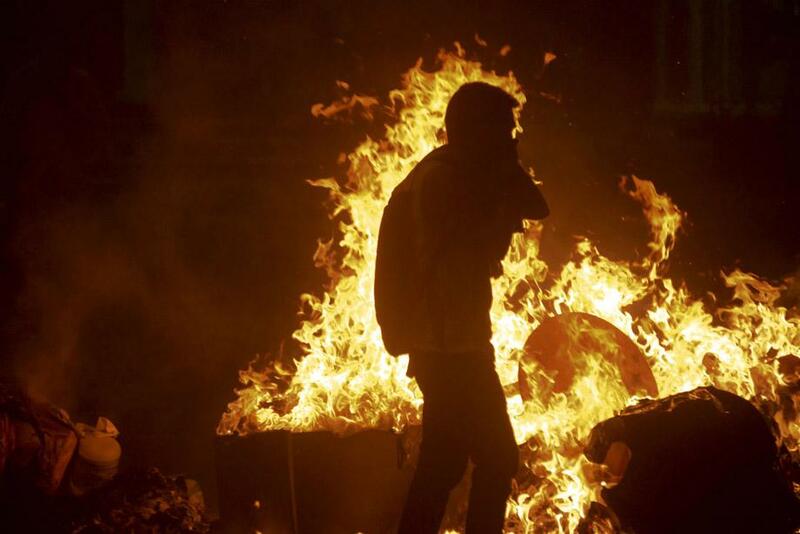 A supporter of opposition leader Leopoldo Lopez sets fire to a barricade during a protest against Nicolas Maduro’s government in Caracas on Feb. 19, 2014. 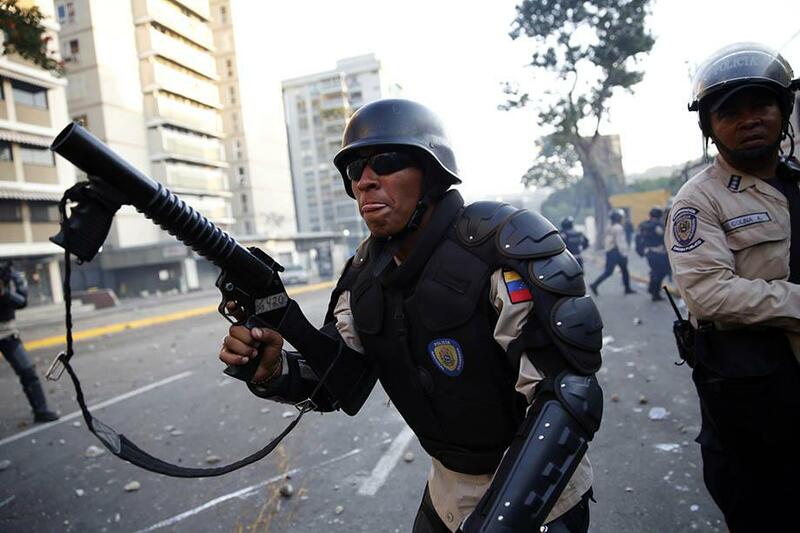 Members of the National Police clash with demonstrators during an anti-government protest in Caracas on Feb. 19, 2014. 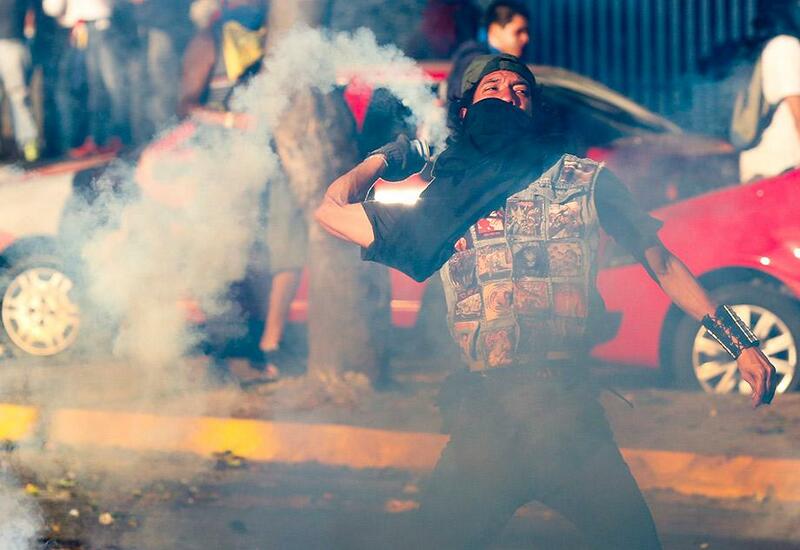 A supporter of Leopoldo Lopez faces riot police during a march on Feb. 18, 2014, in Caracas. 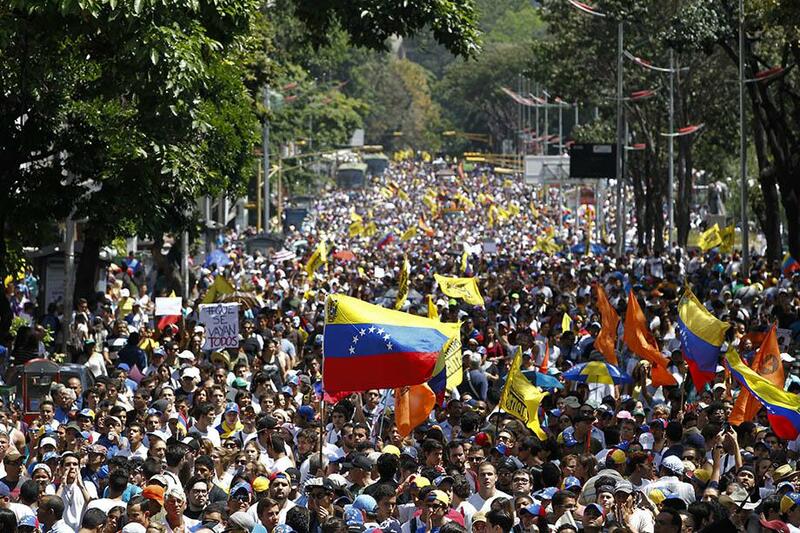 Supporters of Venezuelan President Nicolas Maduro hold a protest against opposition leader Leopoldo Lopez, who was arrested on charges of homicide and inciting violence, on Feb. 19, 2014, in Caracas. Demonstrators protest against Venezuela’s President Nicolas Maduro outside the Venezuelan Embassy in Lima, Peru, on Feb. 18, 2014. 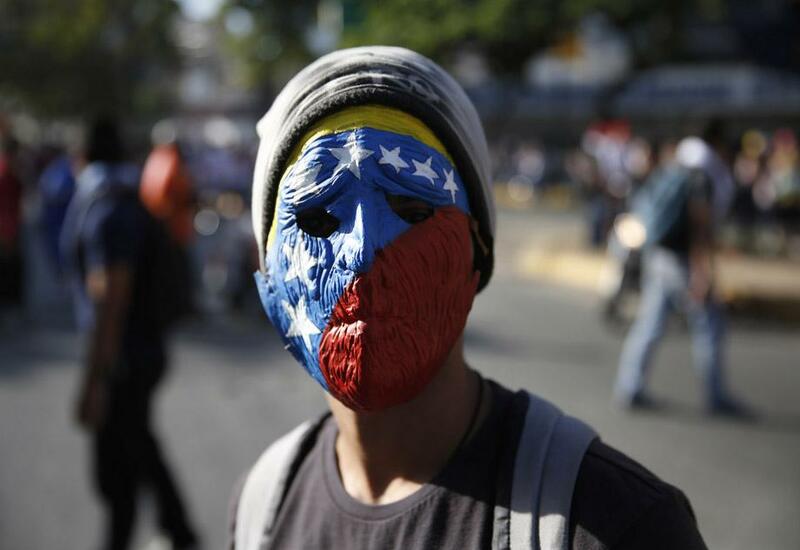 A demonstrator wearing a mask depicting the national flag takes part in a protest against President Nicolas Maduro’s government in Caracas on Feb. 16, 2014. 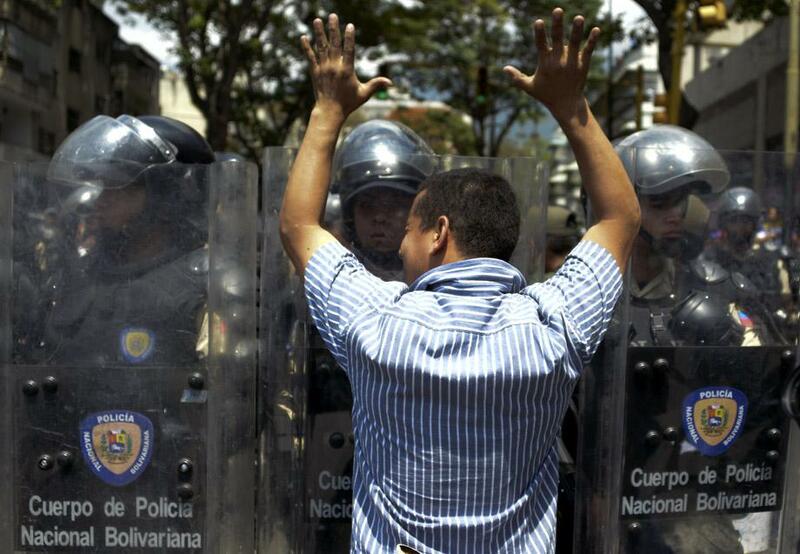 Protesters confront riot policemen during an anti-government demonstration in Caracas on Feb. 19, 2014. 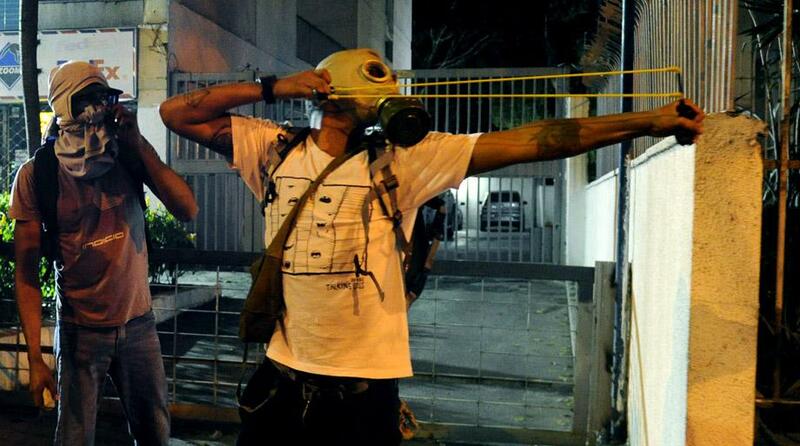 Members of the National Bolivarian Guard fire tear gas to disperse protesters during an anti-government demonstration in the Altamira neighborhood of Caracas on Feb. 19, 2014. 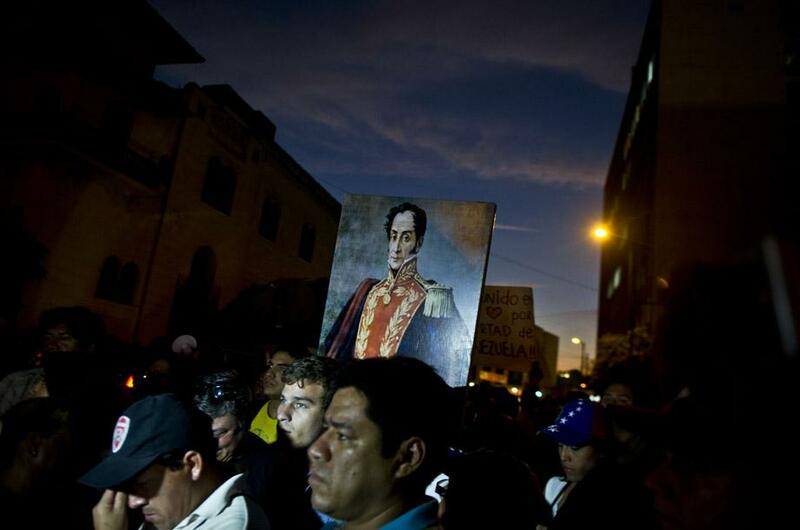 Opposition supporters of Leopoldo Lopez attend a rally before he handed himself over to police in Caracas on Feb. 18, 2014. 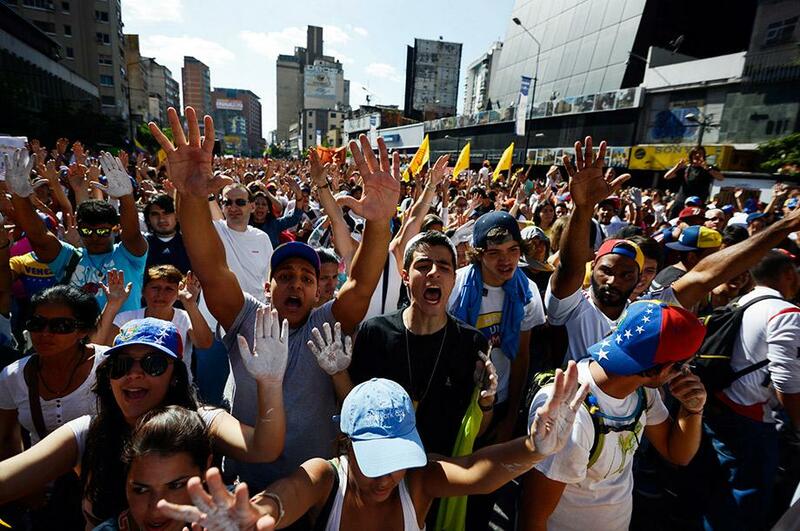 Supporters of opposition leader Leopoldo Lopez stand at a barricade during a protest against Nicolas Maduro’s government in a middle-class neighborhood in Caracas on Feb. 20, 2014. 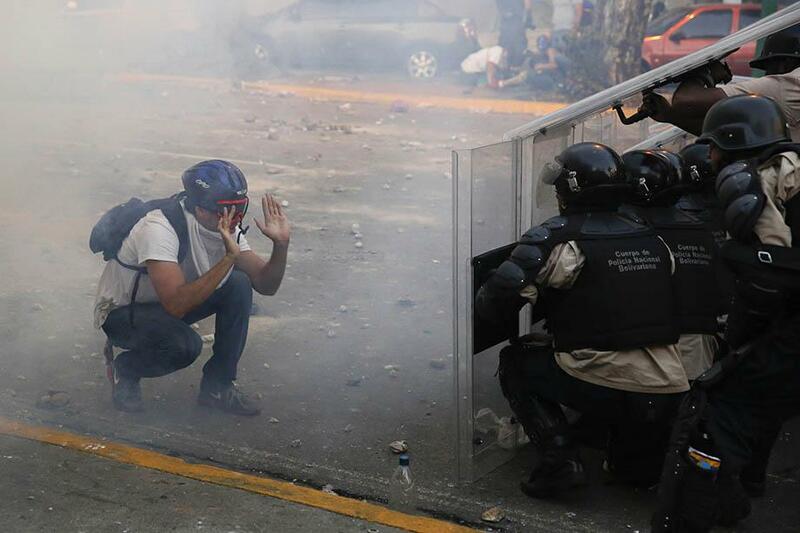 Riot police shoot tear gas as they fight against students during a protest against President Nicolas Maduro’s government in Caracas on Feb. 16, 2014. Opposition demonstrators run away from tear gas during a protest against President Nicolas Maduro’s government in Caracas on Feb. 16, 2014. 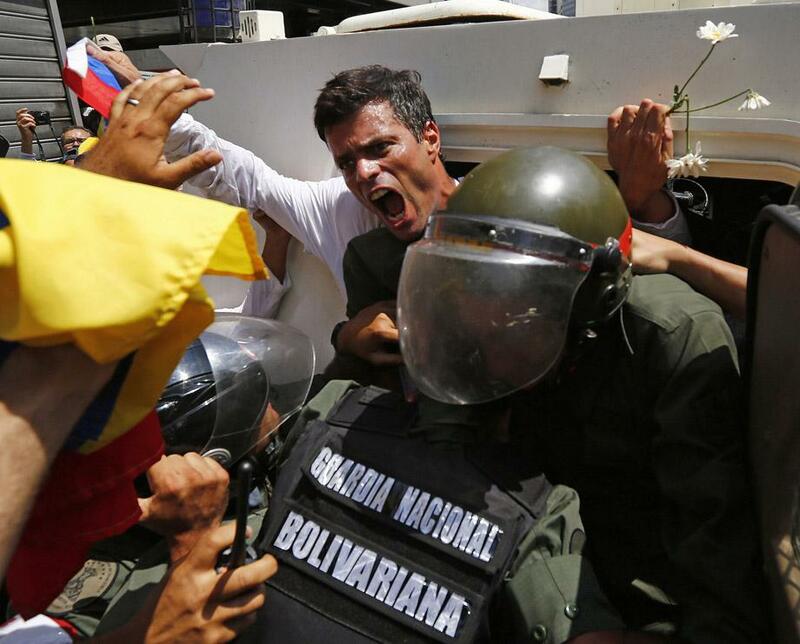 Venezuelan opposition leader Leopoldo Lopez gets into a National Guard armored vehicle in Caracas on Feb. 18, 2014. 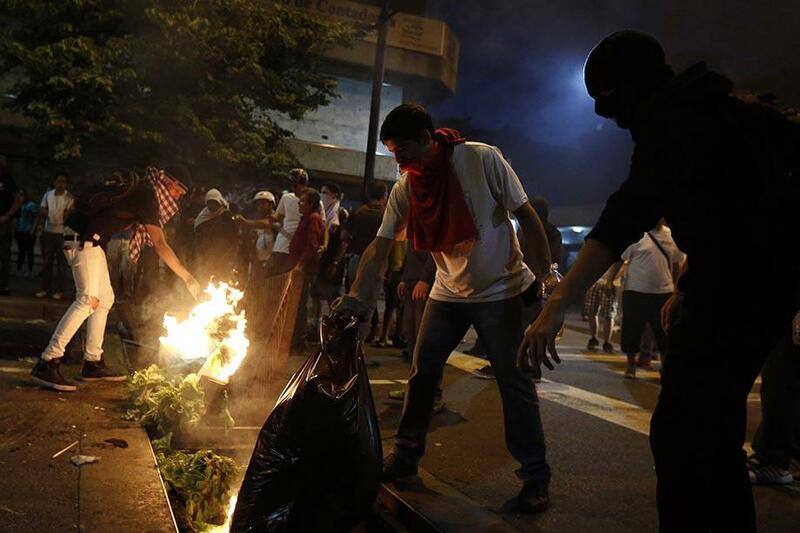 Supporters of opposition leader Leopoldo Lopez light fires on Feb. 18, 2014, in Caracas. 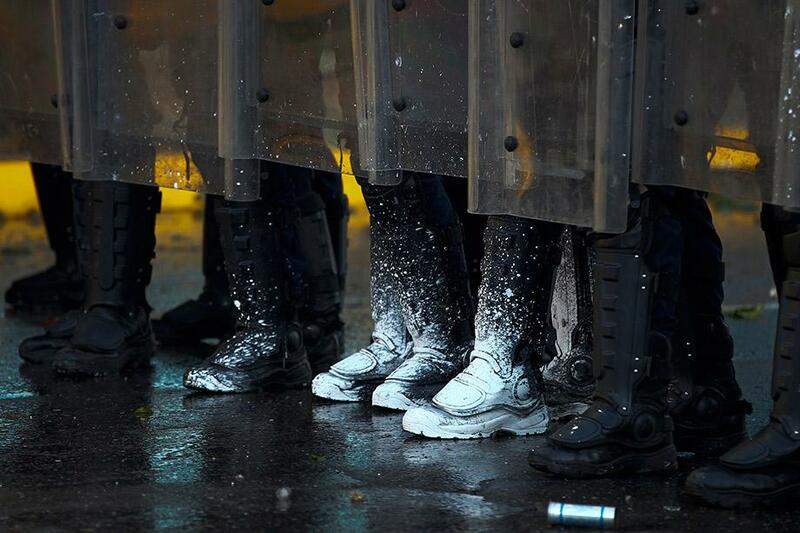 Members of the National Police protect themselves during an anti-government protest in Caracas on Feb. 19, 2014. 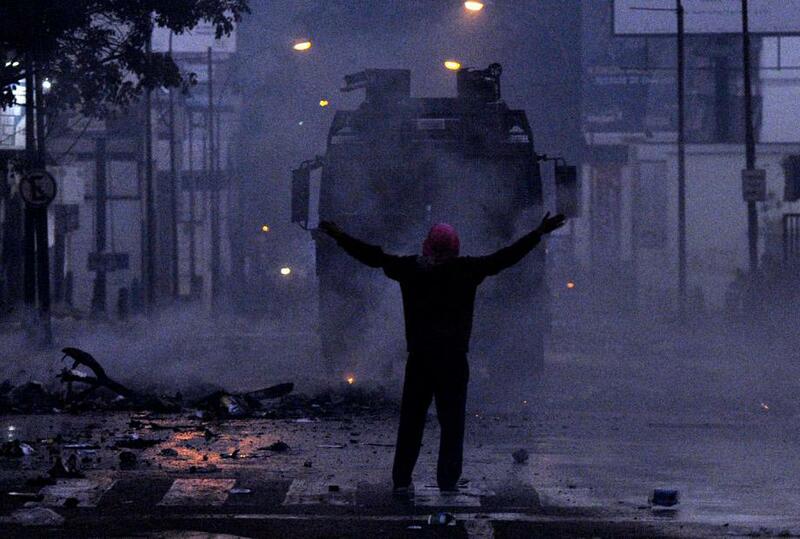 A protester confronts riot police during an anti-government demonstration in Caracas on Feb. 19, 2014. 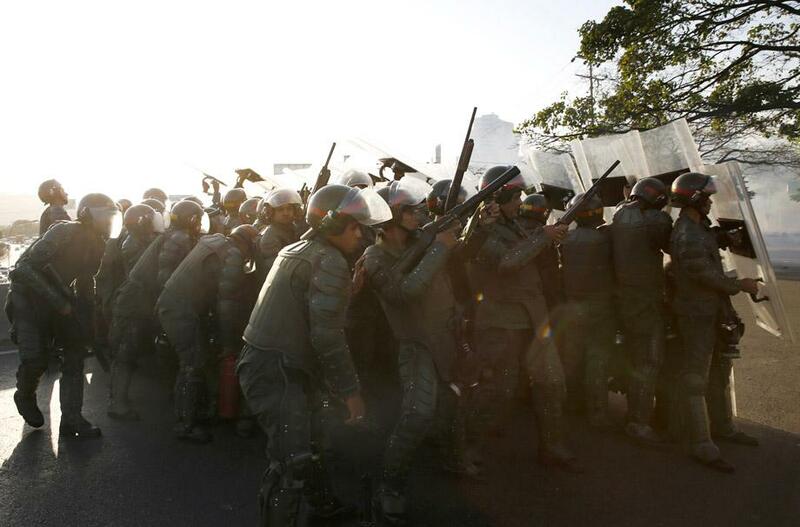 Protesters confront riot police during an anti-government demonstration in Caracas on Feb. 19, 2014. 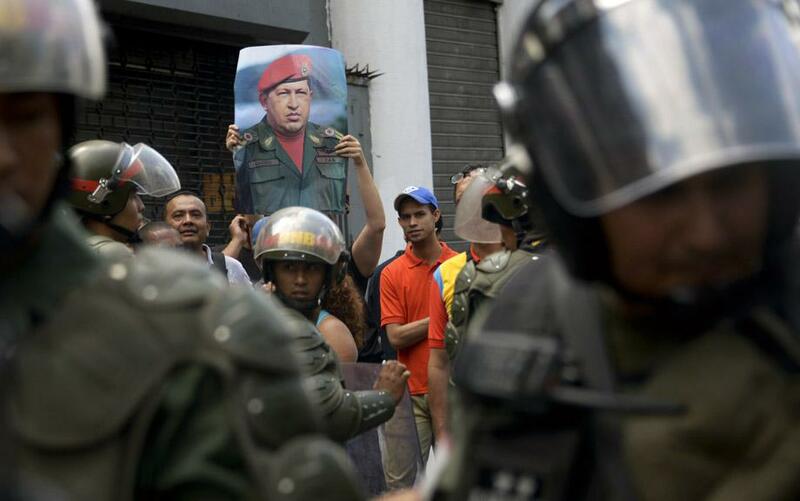 A demonstrator protests the government of Venezuela’s President Nicolas Maduro, in Caracas, Feb. 12. 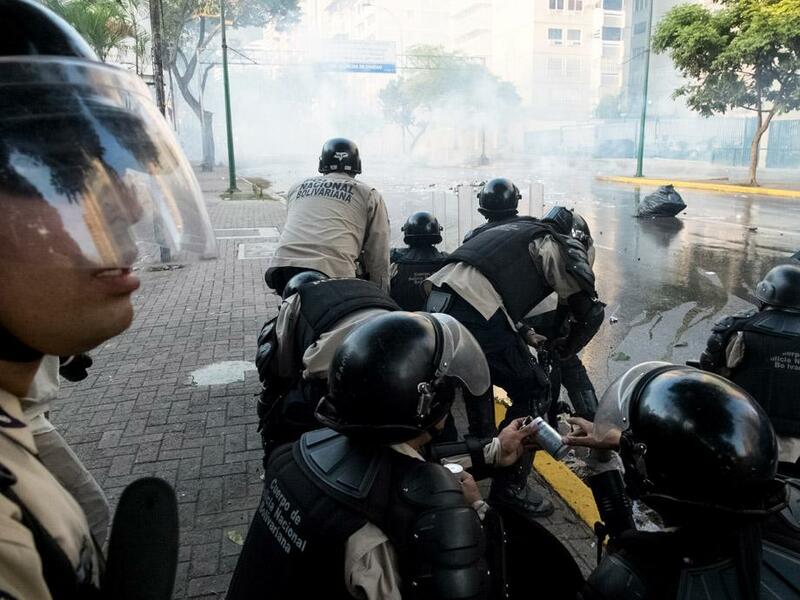 One person was killed during standoffs at the end of an anti-government rally in Caracas last Wednesday, witnesses said, escalating the worst bout of unrest in Venezuela since protests against Maduro’s April 2013 election. Opposition demonstrators on Feb. 12. 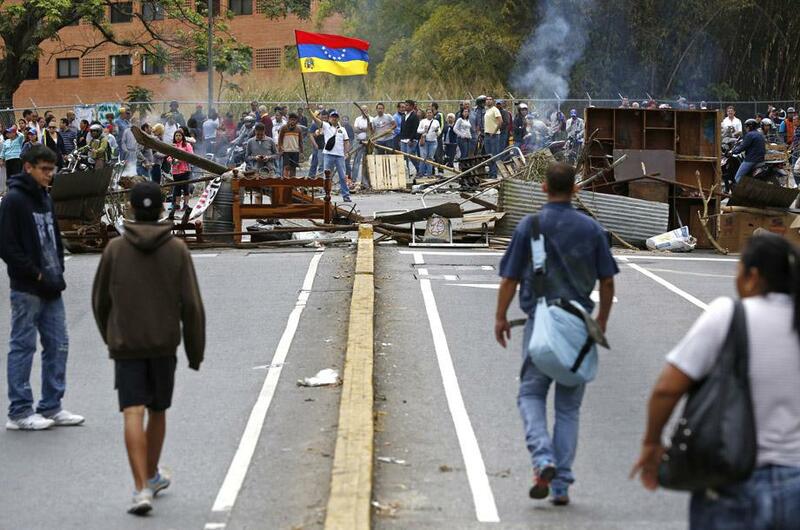 Armed pro-government groups attacked and shot at people protesting against Maduro’s government late last Tuesday in the Andean city of Merida in western Venezuela, injuring five, activists said. 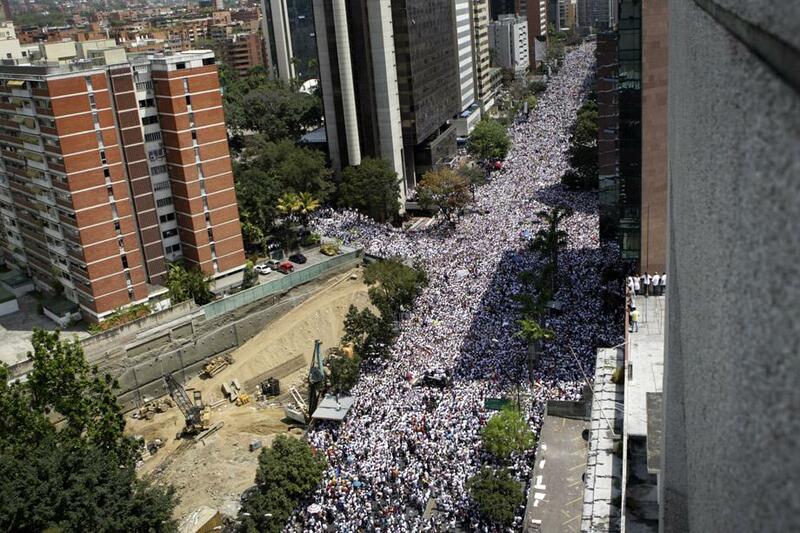 Opposition supporters in Caracas, Feb. 12. 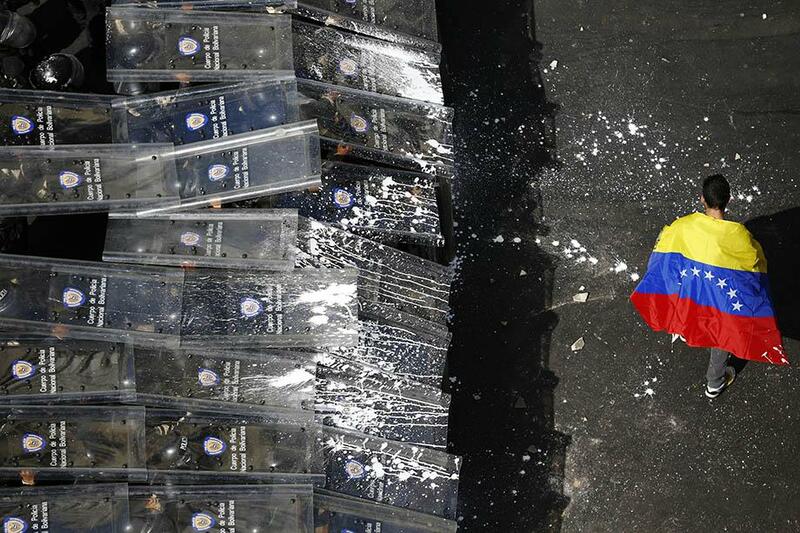 An opposition demonstrator holds a Venezuelan flag in front of a burning barricade in Caracas, Feb. 15. 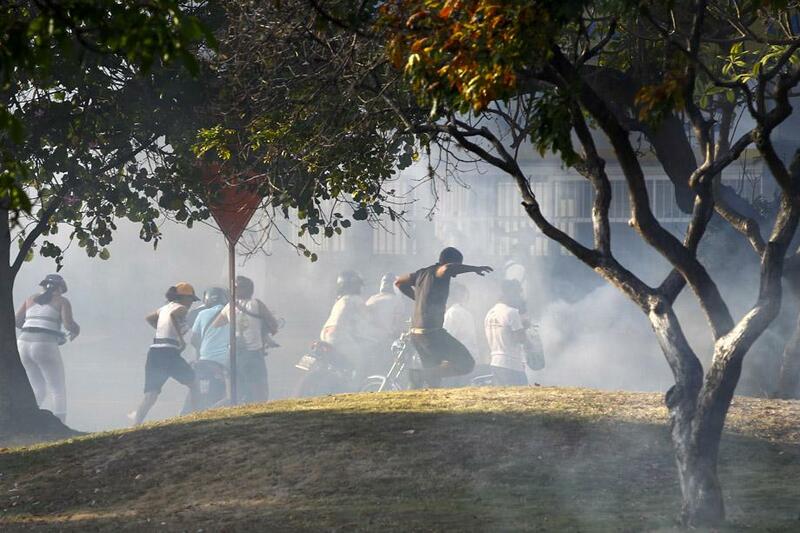 Riot police shoot tear gas at students during anti-government protests in Caracas, Feb. 15. 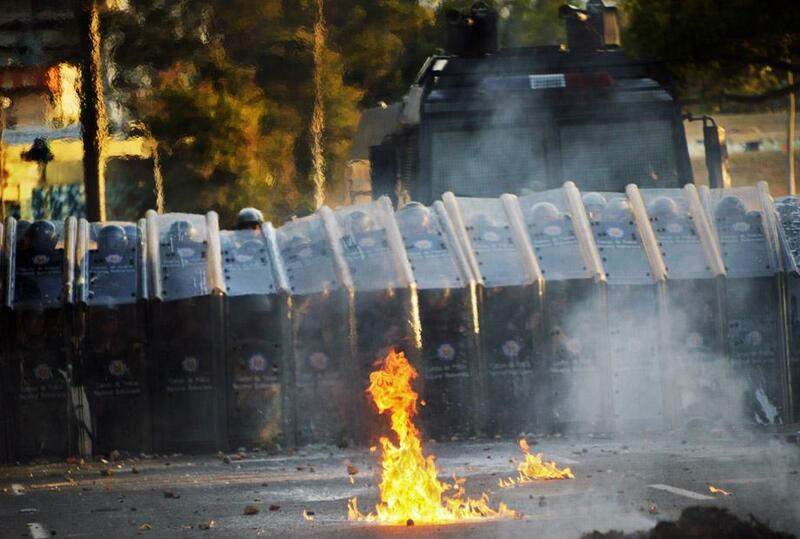 An opposition demonstrator confronts riot police on Feb. 15. 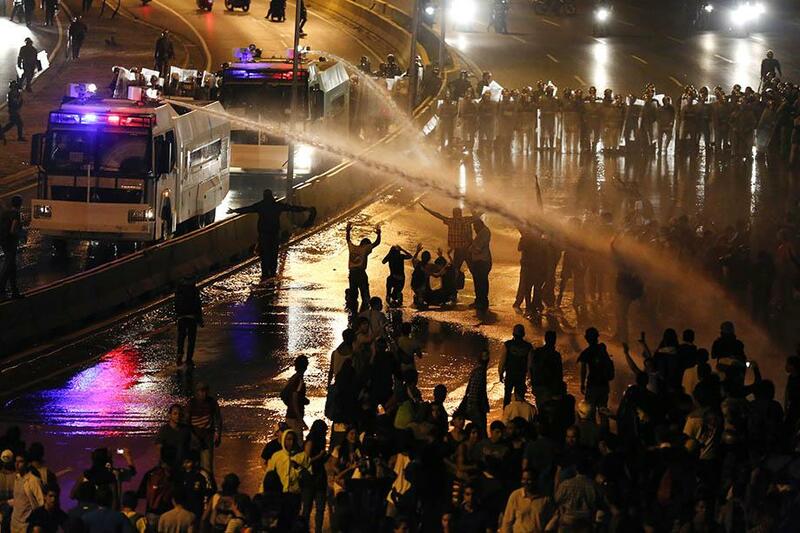 Venezuelan police fired tear gas and turned water cannons on stone-throwing protesters on Saturday to stop them from blocking a Caracas highway during a fourth day of sporadic unrest. 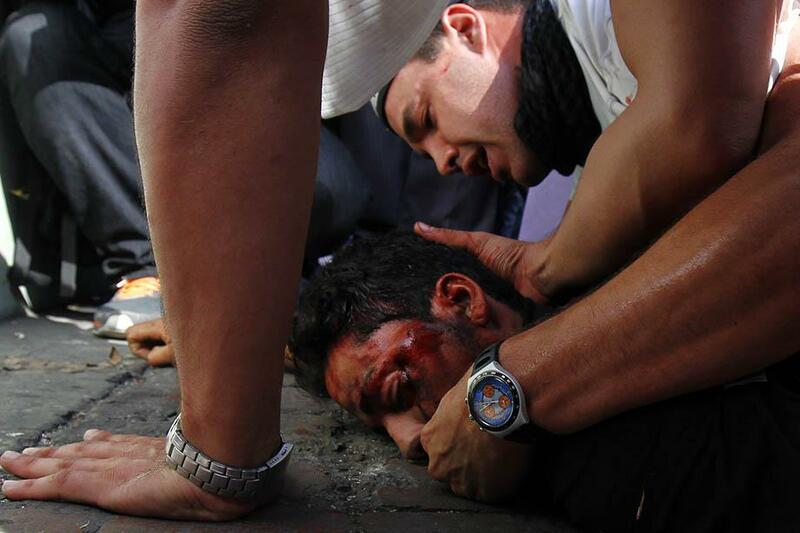 A fallen protester receives help after gunshots were heard during a rally in Caracas, Feb. 12. Assembly president and ruling Socialist Party stalwart Diosdado Cabello said on state television the slain man was a supporter of Venezuela’s President Nicolas Maduro’s socialist administration. 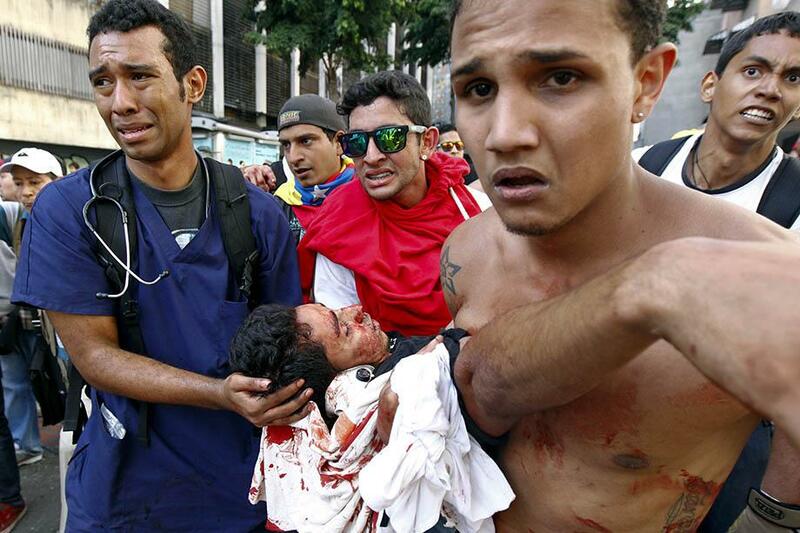 A dead protester is carried away on a motorcycle after gunfire, Feb. 12. 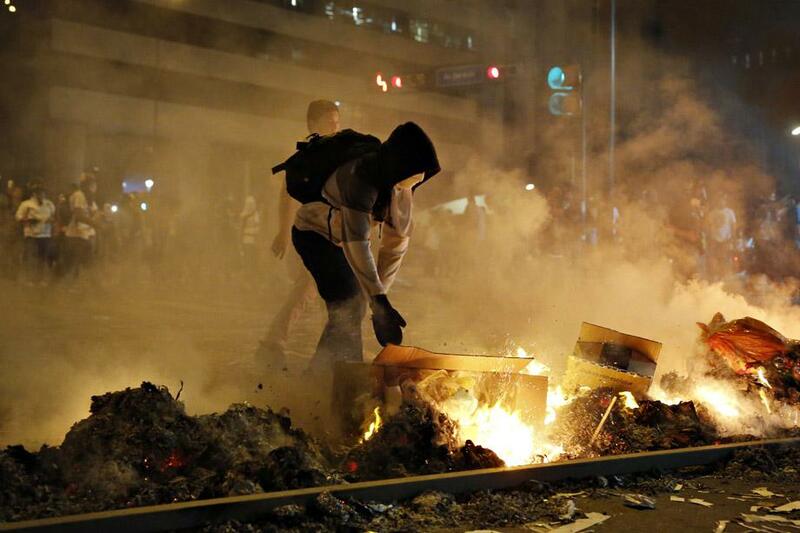 Demonstrators make a barricade of burning garbage in Caracas, Feb. 12. 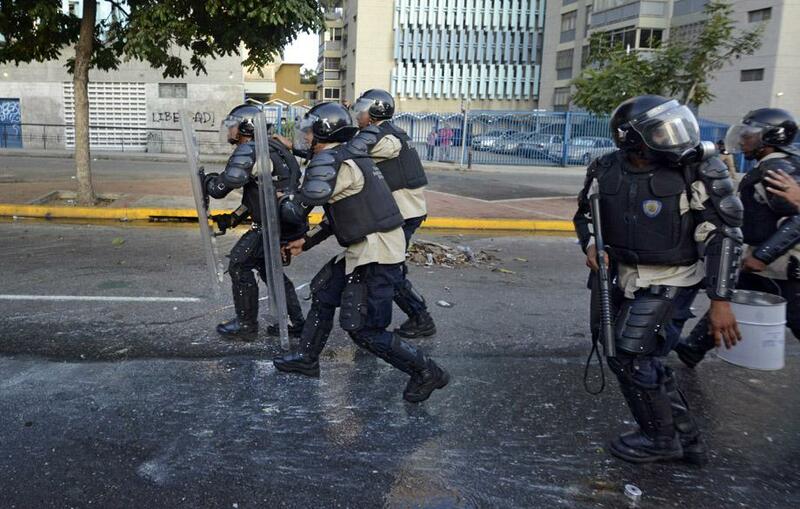 Riot police use water to disperse opposition demonstrators as they block Caracas’ main highway, Feb. 14. 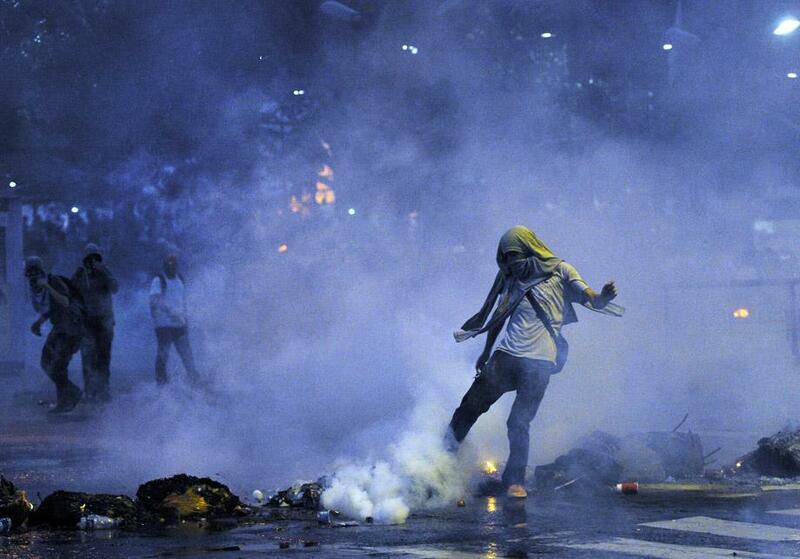 An opposition demonstrator throws a gas canister back at riot police, Feb. 15. 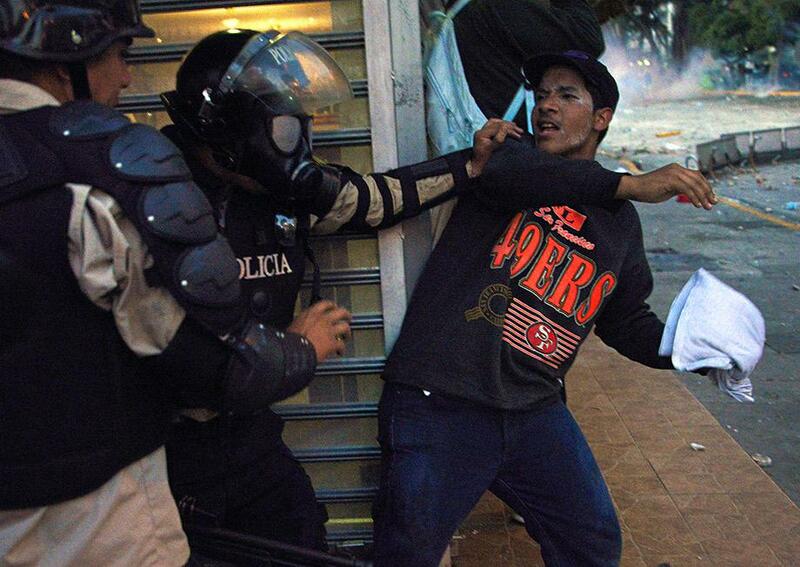 A member of the National Police struggles with an anti-government student on Feb. 15. 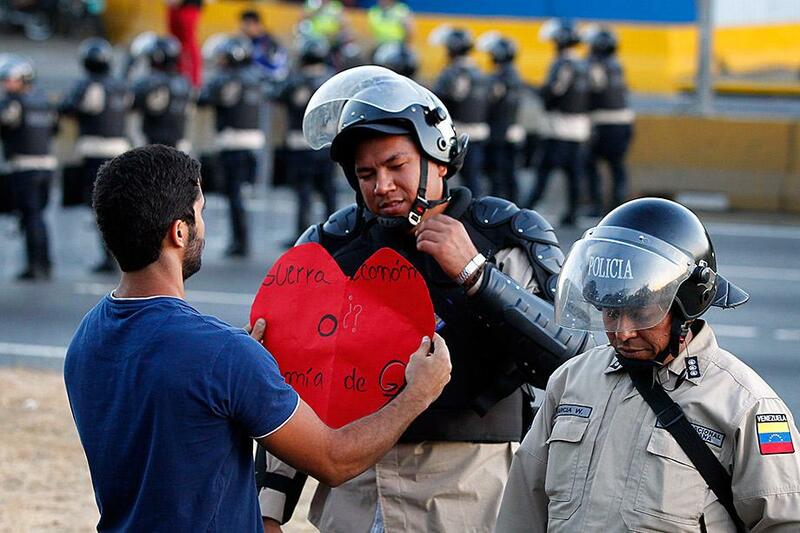 An opposition demonstrator gives a heart-shaped cut-out to a police officer, Feb. 14. 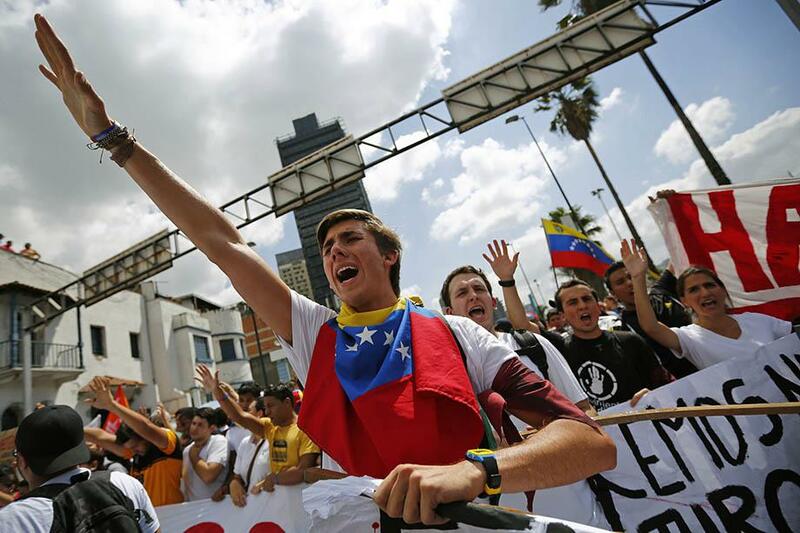 Anti-government students shout slogans during a protest in front of the Venezuelan Judiciary building in Caracas on Feb. 15. 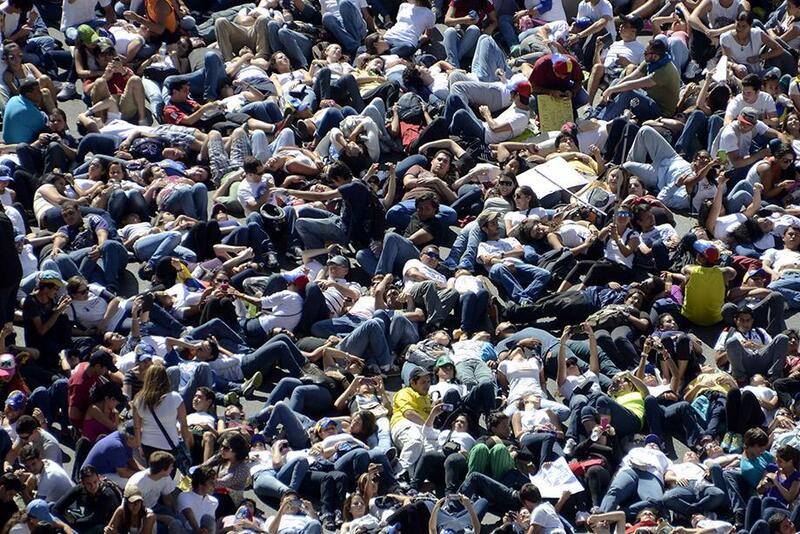 Thousands of anti-government students lie on the ground during a protest in front of the Venezuelan Judiciary building on Feb. 15. 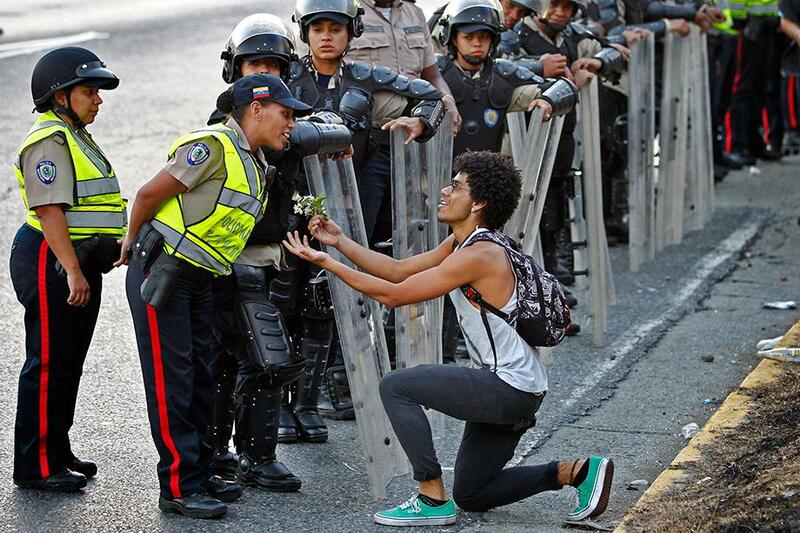 An opposition demonstrator gives flowers to a police officer on Feb. 14. 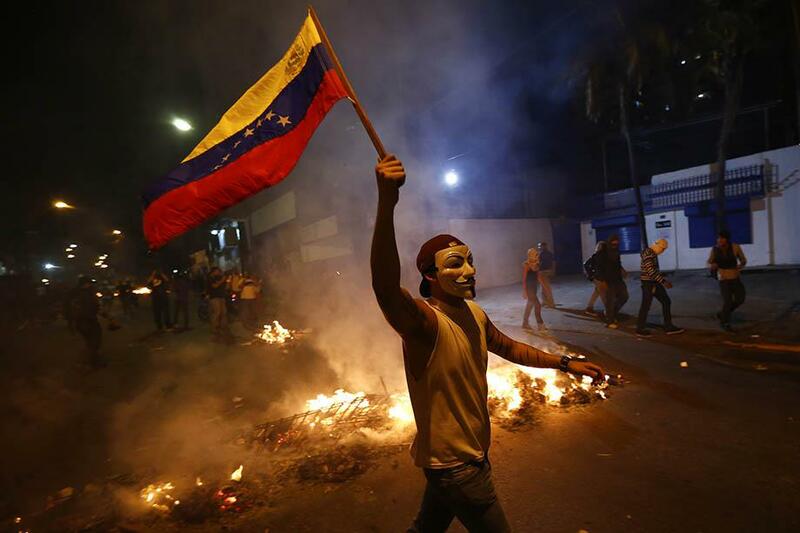 President Maduro’s government kept dozens of student protesters behind bars last Friday as unrest still rumbled across Venezuela. Riot police officers clash with opposition demonstrators on Feb. 15. 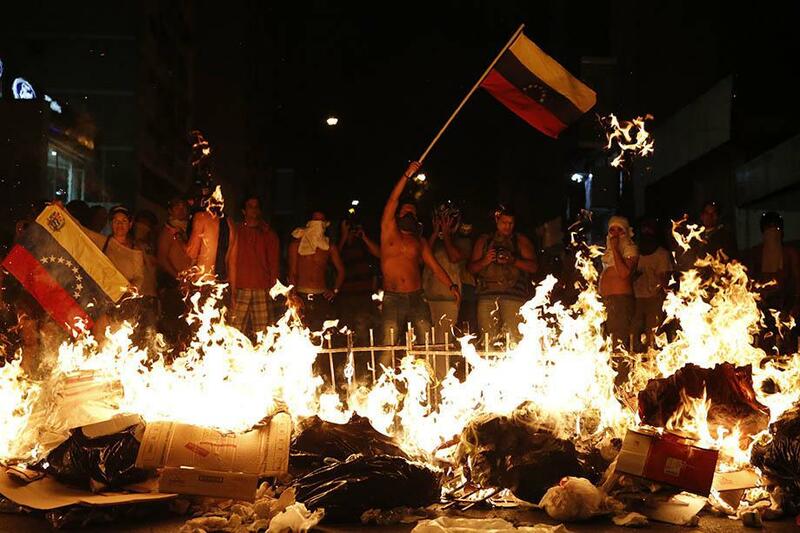 Opposition demonstrators hold a Venezuelan flag in front of a burning barricade on Feb. 15.